A comprehensive range of support and information for families experiencing divorce or separation, whatever their circumstances. The Family Separation Clinic offers specialist services to families experiencing divorce or separation and has particular expertise around parental alienation. The online CAB service that provides independent advice on your rights and practical, up-to-date information on a wide range of topics. Financial advice with tips to help you get through this difficult time and stay on top of your money situation. The College of Mediators is a professional membership body for mediators. Find a family mediator in your area. 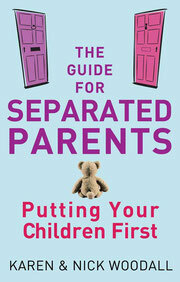 A website dedicated to helping separated dads to deal with the practical and emotional impact of separation and to parent effectively alone. A much needed organisation dedicated to offering non-judgemental emotional support to mothers who are apart from their child for one or many complex reasons. The national voice of organisations supporting families of prisoners. Shelter is a charity that works to alleviate the distress caused by homelessness and bad housing. They offer advice and information. Free confidential, independent advice on dealing with debt. Contact a Family provides support, advice and information for families with disabled children, no matter what their condition or disability. Winston's Wish is a childhood bereavement charity and the largest provider of services to bereaved children, young people and their families in the UK. This US site has a mission to decrease isolation for people who have parents who are lesbian, gay, bisexual or transgender (LGBT), and bring voice to their experiences. Straight Partners Anonymous (SPA) is a support group for straight people whose partner is gay, lesbian, or bisexual. Providing confidential emotional support, 24 hours a day for people who are experiencing feelings of distress and despair. Lots of information about drugs for parents and children. Many smokers want to quit but aren't sure how to do it. Here, you'll find some handy guides to suit different types of people. Information and help around alcohol and problem drinking. Great information about eating well. For information about children's health issues at different ages.